Dynamic DC motors provided by Maxon Motor Australia have helped the German team win the 2010 Robot Football World Cup held recently in Singapore. 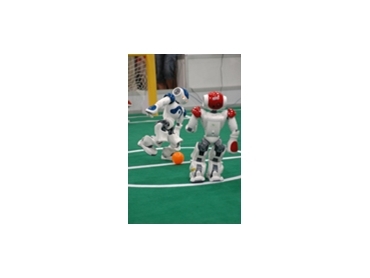 The RoboCup is considered the most important competition in the artificial intelligence and robotics world, with the aim of beating the incumbent human world soccer champions by the year 2050. Over 500 teams from 40 countries took part in RoboCup 2010, with the B-Human team of the German Research Center for Artificial Intelligence (DFKI) at the University of Bremen. They defeated the Australian ‘rUNSWift’ team in the top Standard Platform League with a resounding score of 6:1. The Standard Platform League is considered a true programmer competition, taking advantage of robots developed by the French company Aldebaran Robotis. The small but agile robots are 58 cm high, weigh 4.3 kg and have 25 flexible joints that are all driven by precise Maxon DC motors. They also have two cameras and a large number of sensors that allow them to navigate their way around the field. With this basic configuration, defenders, strikers and goalkeepers can (depending on their programmed DNA) recognize the infrared ball for better or worse, plan moves and shoot at the goal. The robots have been designed not just for research purposes, but with a view to their adoption as home help some time in the future.